As an aspiring home bartender, you need a few essential bar tools that can help you create some fancy cocktails. Ideally, having the whole set of accessories is a great idea; however, having a few essential pieces on hand is good and the bar spoon is an important essential of any bar kit. Nevertheless, before you actually go out and buy a few bar spoons to add to your bar collection, it is a good idea to understand the bar spoon basics. So, what is a bar spoon? It is essentially a specialized spoon used in a bar that simplifies the process of mixing while you make a cocktail. Usually, cocktails are mixed by either shaking them in a cocktail shaker or stirring them. However, when drinks need to be stirred smoothly without any air bubbles and with a soft and silky texture, then a specialized cocktail bar spoon makes the process much easier. Usually, bar spoons are made of high-quality stainless-steel, which makes them extremely durable and they are also very easy to clean and use. Typically, bar spoons are around 10-15 inches in length, which enables them to reach the bottom of tall glasses, pitchers, cocktail shakers, etc. The bowl of the bar spoon is usually smaller and thinner than the standard kitchen spoon and sometimes it also paddle-shaped. The small bowl of the bar spoon lets you stir the drinks in any size of the glass, even narrow types that are filled with ice cubes. Most often, bar spoons are made of stainless-steel, while some of them may be made of other metals too. Stainless-steel, however, is the easiest to clean and the maintenance is also very easy. Usually, bar spoons have long shafts that are twisted which allows you to twist easily while stirring. Some bar spoons feature holes that allow you to layer the drinks. Several bar spoons have a weighted end. This helps to add balance to the spoon and also makes the process of stirring smoother. There are some cocktails that need stirring instead of being shaken and the bar spoon is the best tool for this. 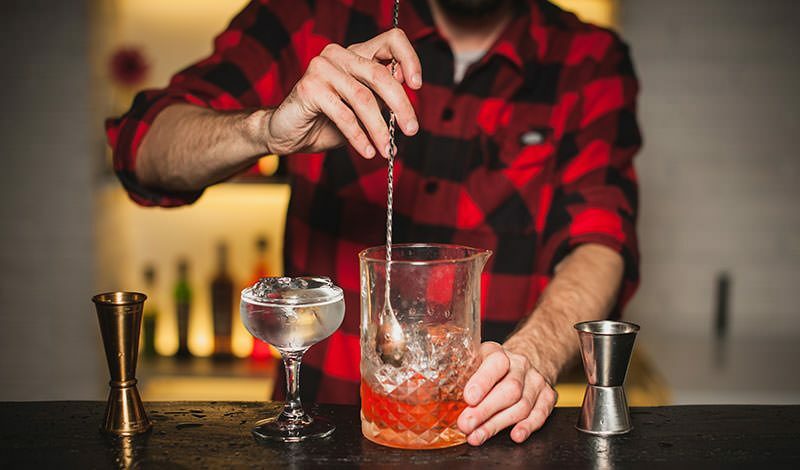 Irrespective of whether you are using a tall glass or a cocktail shaker, the long-handled bar spoon can help to mix the cocktail quickly and easily. The measure of a bar spoon is usually equal to a teaspoon and you can make use of the bar spoon to measure small quantities of ingredients for your cocktail. The bar spoon is usually used to garnish the cocktails or used to remove any extra pulp in case of fruit garnishes. You can use the bar spoon to be creative and layer various spirits in a single drink to create a striking cocktail. Although for the purpose of muddling, a specialized muddler is ideal, some bar spoons have a hammer at the end that can be used to lightly muddle herbs, fruits, etc. American bar spoons are extremely simple in their design and they have a twisted handle and are characterized by the plastic red cap at the end. 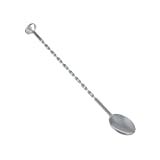 These bar spoons are usually quite inexpensive and can be bought easily at any store selling bar supplies. The European variety is sturdier and usually has a disk or a hammer at the end of the handle, which can be used for various purposes like layering liquors, muddling, etc. The Japanese version of the bar spoon is sturdier and has a slimmer and longer design. The end of the handle of the bar spoon may have a fork that can be used to pick up garnishes, olives, etc. or it may have a teardrop design. There are many options and brands of bar spoons out there that you can choose from. We have reviewed some of the best bar spoons available to make your choice easier. If you want to show off your bartending skills, then the Hiware Stainless Steel Mixing Spoon is a great bar accessory to have in your home bar. The tall and slender Hiware mixing spoon is ideal for use with your tall glasses, pitchers and cocktail shakers and allows you reach into them easily. The swizzle stick action provided by the twisted stem of the 12-inch mixing spoon allows you to stir your drinks comfortably. And, the lovely teardrop design of the bar spoon is sure to add to the elegance of your bartending. Made of 18/10 high-grade polished stainless steel. Versatile mixing spoon that allows you to mix your cocktails, juices, milkshakes and a whole lot more, evenly. Long 12-inch stem allows you to reach tall glasses and shakers very easily. Resistant to corrosion and very easy to clean. Thin and sleek design fits into any cup size easily. The twisted center of the spoon allows it to spin very easily and offers better grip and control. Edges may be sharp and the coil may feel uncomfortable while handling. Spoon end a little on the smaller side. Manufactured with superior-grade stainless-steel, the Hiware 12” mixing spoon is quite durable and comfortable to use. Now, you can mix your drinks without splashing and creating a mess and the spoon is very easy to clean in your dishwasher. The long and twisted mixing spoon is a great blend of balance and good looks that will definitely add to your style when you’re churning out your creative cocktails. If you’re looking for the perfect spoon to mix your cocktails, then considering the Purefold 12” Cocktail Mixing Spoon may be a good option. The cool spiral design of the cocktail mixing spoon makes it a stylish accessory. The spoon is 12 inches in length, which makes it ideal for use in deep cups. Made of high-quality stainless-steel, the boutique bar spoon is very durable and it is so versatile that it can be used for various purposes other than just in your bar like in your kitchen to mix your juices, milk, iced tea, etc. Made of superior-quality 18/10 stainless steel which makes it durable and resistant to corrosion. Easy to use and very simple to clean. The spiral pattern of the spoon makes it very easy to grip and stir evenly. The 12-inch length makes it comfortable to use in deep glasses, large pitchers and carafes. The spiral handle may be difficult to hold. The Purefold Mixing Spoon is a great buy as you can use it for different purposes other than just for mixing your drinks in the bar. 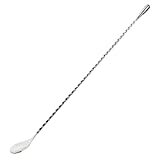 The length of the spoon and its versatility makes it quite useful in the kitchen and for other practical uses too. Made of superior-quality steel, the twisty-stemmed Purefold cocktail mixing spoon is definitely a great addition to your bar accessories kit. A cocktail spoon is a useful bar accessory and the Swissmar Stainless Steel Cocktail Spoon is a great one as is equipped with a little hammer at the end and doubles up both as a bar spoon, as well as a muddler. You can also use the hammer to break up ice if required. The end of the 103/4-inch polished stainless-steel cocktail spoon has a slightly serrated tip that lets you strain the drinks easily. The serrated edge of the spoon allows for easy straining. Manufactured with superior-grade stainless-steel, which makes the spoon durable and resistant to corrosion. The hammer at the end of the spoon doubles up as a muddler and can be used to break apart the ice cubes. The edges of the helix pattern of the spoon are not rounded and is a bit wide. The handle of the spoon may be a little short. So, if you’re looking for a nice cocktail spoon to stir your cocktails easily, then the stainless-steel Swissmar cocktail mixing spin is the perfect spoon to consider. If you are not really particular about the length of the spoon, then the Swissmar cocktail spoon with the hammer end is a great accessory to include in your well-outfitted bar. Bar spoons are simple, yet functional accessories that are an important part of any bar. However, since people have varied preferences of cocktails, it is essential that you find the right cocktail bar spoon that is ideal for your bar at home.